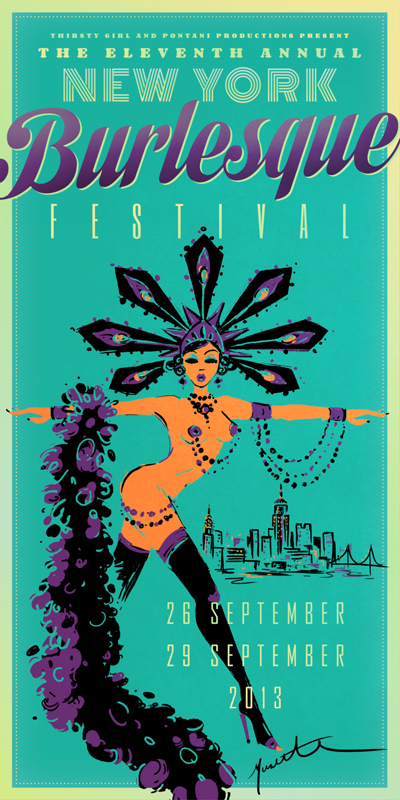 It’s time, once again, for the biggest burlesque event to hit the Big Apple: the 11th Annual New York Burlesque Festival. The whole thing kicks off this Thursday, September 26 and organizers Angie Pontani and Jen Gapay (of Thirsty Girl Productions) always put on an unforgettable show. This festival is not only the longest running annual burlesque festival, but it has become one of the festivals that other producers look to for inspiration. Every sub-genre of burlesque is represented: boylesque, neo-burlesque, nerdlesque, etc. Just one gander at this year’s lineup is enough to make your head (or tassels) spin. There are performers from nearly every corner of the planet: the UK, Sweden, Italy, Australia, even Russia! Basically, if you want to witness what is going on with burlesque in 2013, look no further. It’s all represented at this world-class festival. We interviewed Jen last year in honor of their 10th anniversary and I encourage you all to check out that interview, especially if you are event producers yourself. Jen has an impressive track record of festival organization including The Capitol Hill Block Party in Seattle, the Siren Music Festival at Coney Island, The Glamour Ball on Fire Island, The New York Boylesque Festival which is now in its 2nd year and The Coney Island Talent Show, now in its fourth year. She was also the Associate Producer of the documentary, Last Summer at Coney Island, which aired on PBS in May 2011. Tags: 11th Annual New York Burlesque Festival, Angie Pontani, burlesque, festivals, Hollywood Burlesque Festival, Hollywood Burlesque Festival Fundraiser, Jen Gapay, Las Vegas Burlesque Festival, Las Vegas Burlesque Festival Thursday Night Showcase, Los Straightjackets, Southern Fried Burlesque Fest, Syrens of the South Productions, Tease Tuesday Halloween Edition, Thirsty Girl Productions, Tuesday Tease, World Famous Pontani Sisters.